Strength training or weightlifting for basketball players is different than lifting in other sports due to the skill demands of the sport. 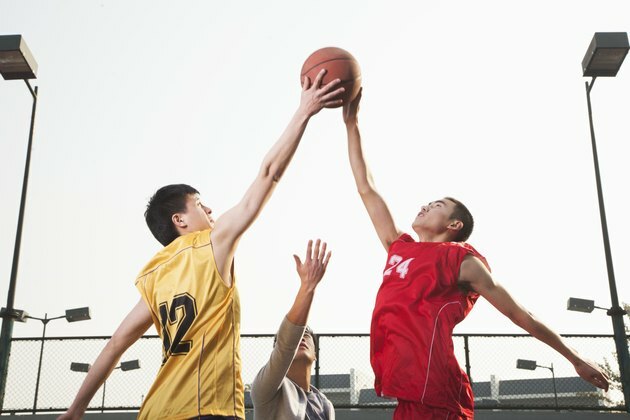 According to the Sports Fitness Advisor, basketball players need explosive power and coordination more than size. There are several schools of thought regarding basketball and lifting and whether workouts should occur before or after practice. The main reason that a debate exists for the scheduling of basketball weight training is because of the skill demands basketball has. Basketball players must use virtually every muscle and often finesse or touch is just as important as strength. Some believe that lifting before a practice or game will wear players out and tire the muscles so much that it will mess with the ability to shoot or put touch on the ball. Some believe that shooting can be affected long term by compensating for tired muscles. Most teams and players prefer to work out after a practice or even after games. According to former basketball player Thomas Emma, lifting after a practice or game should be done immediately after and be performed for no longer than 30 to 35 minutes. The idea is that the muscles will still be warm and they will not be worn out by a short session, therefore you will still get some strength benefits. This also eliminates any worries about messing up shooting form because there will be an extended rest time before the next game. According to Stack Magazine, some players, including basketball legend Michael Jordan actually prefer lifting before games or practices. Former Jordan trainer Fred Whitfield notes that before practice sessions focused on light weights, quick reps and agility work and avoided heavy lifts. That plan was designed to alleviate the concerns of practicing or playing basketball directly after the workout. According to Emma, the best way to make a decision regarding lifting is to see how individual players respond to strength training. Emma notes that some athletes like Jordan can immediately play with no ill effects, while others need 48 hours to recover from a heavy lifting session. It is important to monitor muscle soreness which can affect flexibility and movement on the court. Emma suggests even substituting weightlifting for regular practice at times so players have more time to recover before basketball skill activities. Is Weight Lifting Good for Soccer Players?